Got a new pair of safety/work boots today, very comfy - love the look. If the link doesn't work you can go to levelly.com and do a search for Pica. Got a new, better than my old, PRCD-S (Switched Protective Earth - Portable Residual Current Device) from Kopp Germany today. Bought it after someone explained to me why the product I have used before from a different manufacturer is basically useless, quite shocking (no pun intended) given this is supposed to be a safety device. I find it immensely revealing to see all the lamello (euro) kit arriving in systainers and the true position (us) kit in a glorified cardboard box... only made more laughable by the little plastic handle esp given the price! Wasn't today, but my most recent non-Festool purchase was a BuildClean air scrubber. I'm digging it so far. It's not the magic air cleaner I had in my imagination, but I do notice an improvement. I don't usually notice the noise because I work with ear protection always, but when the client comes in, I have to turn the jet engine down to 1. Bought the UJK Dovetail jig. I was tempted by the Leigh but it was more than twice the price and I doubt it will get a lot of use. Recieved the Bosch GAM 270 MFL Digital Angle Finder from Acme Tool today. I got tired of using my small digital angle finder for longer work. It has great features including a lazer. It will be great for checking for square the steel/aluminum entrances that are a large part of the work I perform. Got me a water/dust/weather- and construction-site-proof "garage" 782 x 385 x 379 mm / 91 l (for my tool bag which is not water resistant and other stuff) and a diamond cutting disc. Looks like Knipex, if so, you will never regret that purchase. Best pliers I have ever seen, worth every penny! ... Amazingly good for the $'s. Without a proper cellar I only keep a few cases on hand and mix it up with bottle shop purchases as we like variety. A cellar is a big tick item for the next place!!! As expected the package containing my new Fluke T 150 VDE was delivered today, great piece of equipment - loving it! You can alway use a rough chisel or two, so I'm not so upset about those. Had a play with it yesterday for first time. Trying it! Straight away noticed something... and I think Lamello are missing a trick here. I thought if I wanted to fix two clamex fixings ontop of each other I would have to drill two access holes on both timber faces inside and out. I thought that would be daft why doesnt the clamex have a hole on both sides so I only need one access hole. So I removed the rotating metal cam from the clamex and drilled another hole though. I reinserted the metal cam. I drilled a access hole from one side through both lamello P slots. At first I thought I might have trouble with alignemnt of the two allan key holes but Alan Key went through easily. One of these, but in the 3m version. Also made in Germany and also absolutely superb!!! 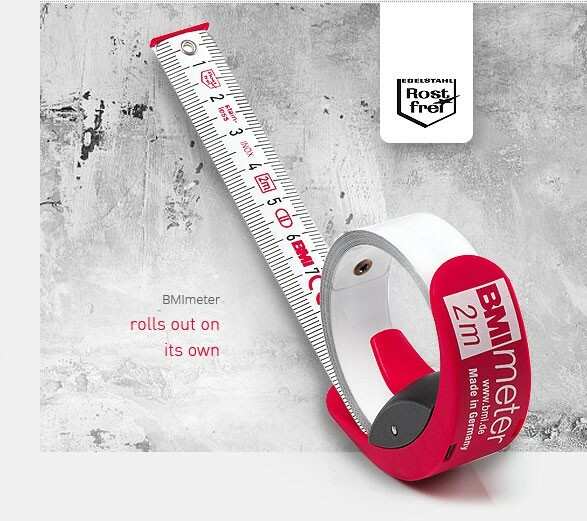 This stainless steel tape measure baffles everyone I show it to. Yes, it opens itself, as if by magic. Very useful when working single handed on large panels. Super light too, with nothing to go wrong. Whoever designed these is a genius!! I bought the Veritas honing guide set, three of the Diasharp stones, and the medium and carvers inflateable sanding drum set and sleeves.